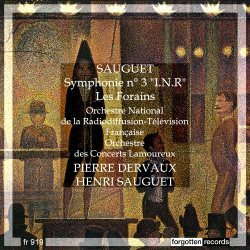 Browsing Amazon I'm rather taken aback by the dearth of recordings available of the music of Henri Sauguet. Of the little there is, much has been deleted. I first discovered his music a year ago when I bought a 4 CD set of his four symphonies on the French Patrimoine label played by the Moscow Symphony Orchestra under Antonio Almeida. These performances can also be obtained separately on Marco Polo. I was won over immediately, so progressed onto "Enregistrements Inédits", a selection of instrumental works issued by Ina, Mémoire Vive. For those unfamiliar with his name, he originated from Bordeaux, but moved to Paris in 1921 at the prompting of Darius Milhaud. He became closely associated with "Les Six", so much so that some came to regard him as its seventh member. His style is fairly eclectic, incorporating influences of the Montparnasse group, with a dash of Satie and Stravinsky thrown in for good measure. He was prolific, having four symphonies, several ballets, an opera entitled "La Chartreuse de Parme", film scores, religious music, many songs and chamber music to his name. With the exception of the ballet score “Les Forains”, which is taken from a Philips LP transfer of Polydor 78s, the recordings derive from live radio broadcasts taped between 1948 and 1956. The First Symphony, known as “Expiatoire” (Expiatory), was written at the end of the war, and is a tribute to the victims. The first movement has a Sibelian complexion, underpinned by those rhythmic undercurrents favoured by the Finnish composer. The second movement is an absolute delight, intensely lyrical yet with a hint of nostalgia. The third movement's militaristic stance, in the form of a march, summons up thoughts of Prokofiev. Sauguet ends the symphony with a dark, brooding finale recalling, no doubt, the desolation of war. I have to say that this performance, albeit in dated sound, captures the essence of the music in a more involved way than the Almeida recording. Bour's tempi are faster in all four movements, with the performance, as a whole, more vitally compelling. The first disc is fleshed out with a stirring performance of Bloch's Schelomo. 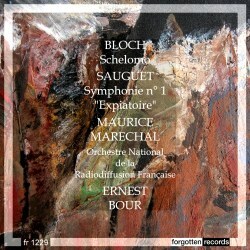 The soloist is the distinguished French cellist Maurice Marechal (1892-1964). The recording balance isn't ideal. He's too forwardly placed in the sound picture, with the orchestra severely recessed. Nevertheless he delivers a reading of profound devotional intensity, his rich burnished tone ideal in projecting the emotional range and ardent yearning of the piece. Sauguet titled his Third Symphony, not only after the Institut National Belge de Radiodiffusion, but the “INR” equally refers to the three movement markings – Impetuosamente; Nobilmente; Risoluto. The opening movement has a bombastic thrust, and is both dissonant and angular. There seems to be no let up from the restless underswell which permeates the music. The second movement, which is a passacaglia, begins unusually with some percussion gestures, which create a surreal soundscape. The whole movement is sombrely etched. The finale is resolute and determined to make its presence felt. Dervaux’s purposeful direction results in a performance of high tension and visceral intensity. “Les Forains” has fared better than the symphonies in having at least two commercial recordings made, besides this one. Here we meet the composer in lighter vein. The score was composed in 1945, so is contemporaneous with the First Symphony. Its inspiration is the travelling gypsy circuses of Bordeaux, and Sauguet infuses this intensely colourful score not only with copious melody, wit and exuberance, but also with more pensive moments. It's beneficial having the composer's own thoughts on the work in this thrilling performance, which sounds terrifically vibrant for its age. The sound quality throughout is perfectly acceptable.